I’m taking a break from shojo romances and seinen shoot-em-ups in favor of two books aimed squarely at older comics connoisseurs. The first is Helen McCarthy’s The Art of Osamu Tezuka: God of Manga (Abrams Comics), an award-winning biography of Japan’s best-known manga-ka. (Her book just nabbed a Harvey in the Best American Edition of Foreign Material category, a category normally reserved for translated comics such as Yoshihiro Tatsumi’s Abandon the Old in Tokyo.) The second is Korea As Viewed by 12 Creators (Fanfare/Ponent Mon), a much-anticipated follow-up to the critically acclaimed anthology Japan As Viewed By 17 Creators. Which ones deserve a place on your bookshelf? Read on for details. BY HELEN MCCARTHY • ABRAMS COMIC ART • 272 pp. 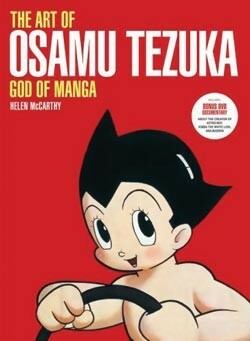 In the introduction to The Art of Osamu Tezuka: God of Manga, author Helen McCarthy argues that Tezuka’s work merits scholarly attention, but also deserves a more accessible treatment as well, one that acknowledges that Tezuka “was first and foremost a maker of popular entertainment.” Her desire to bring Tezuka’s work to a wider audience of anime and manga fans is reflected in every aspect of the book’s execution, from its organization — she divides her chapters into short, one-to-three page subsections, each generously illustrated with full-color plates — to its coffee-table book packaging. As one might expect from such an ambitious undertaking, the results are a little uneven. The strongest chapters focus on the unique aspects of Tezuka’s work, exploring a variety of creative issues in straightforward, jargon-free language. McCarthy provides a helpful overview of Tezuka’s “star system” (a.k.a. recurring figures such as Acetylene Lamp and Zephyrus) and traces the evolution of his storytelling technique through dozens of series, debunking the notion that he “invented” cinematic comics while carefully spelling out what was innovative about his manga. McCarthy also makes a persuasive case for Astro Boy as one of the most important works in the Tezuka canon, the series that most clearly anticipated his mature style. As a biography, however, The Art of Osamu Tezuka offers little insight into Tezuka’s personality beyond his relentless perfectionism and strong work ethic. McCarthy’s attempts to situate Tezuka’s work within the context of his life and times feel glib — a pity, as she makes some thought-provoking observations about Tezuka’s recurring use of certain motifs — especially androgyny, childhood, and disguise — that beg further elucidation. That said, The Art of Osamu Tezuka largely succeeds in its mission to educate fans about Tezuka’s work process and artistic legacy, clarifying his place in Japanese popular culture, exploring his animated oeuvre, and introducing readers to dozens of untranslated — and sometimes obscure — series. A worthwhile addition to any serious manga reader’s library. This anthology of twelve short stories, six by Korean artists and six by French, follows the same basic template as Japan As Viewed by 17 Creators, offering brief, impressionistic scenes of contemporary Korean life. Though 17 Creators is a uniformly excellent work, its companion volume is not; the stories run the gamut from pedestrian to brilliant, with the Korean artists making the strongest contributions. The unevenness of the collection is attributable, in part, to a home field advantage. 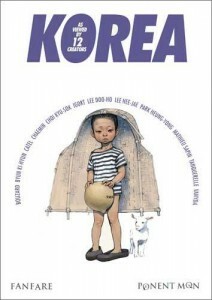 Artists such as Choi Kyu-sok and Byun Ki-hyun tackle deeper, more penetrating topics than their French counterparts, exploring homelessness (“The Fake Dove”), sexual discrimination and violence (“The Rabbit”), and the decay of traditional social networks (“The Rain That Goes Away Comes Back”). Though the artists’ ambition sometimes outstrips their allocated space, all three stories boast beautiful, detailed artwork that suggests the rhythm and feeling of modern urban life. The French contributions, by contrast, are travelogues of one sort or another: in “Beondegi,” for example, Mathieu Sapin imagines what it would be like for a French-Korean woman to return to her parents’ home country, while in “Letters From Korea,” Igort offers brief descriptions of places he visited in Seoul. The weakest of the collection is Catel’s “Dul Lucie,” an uneventful travel diary filled with observations about “doll-like” and “sensual” Koreans that — in English, at least — leave a bad aftertaste of exoticism. Though the other French artists are not as patronizing, the stories feel shallow; imagine an essay about New York City written by someone who only visited Times Square, and you have some idea of how superficial these artists’ appreciation of Korea seems to be. Two stories make this collection a worthwhile investment. The first is “Solgeo’s Tree,” by Lee Doo-hoo, in which a monk paints a mural so life-like that birds attempt to perch in its branches. Told with almost no dialogue, the story relies heavily on Lee’s exquisite pen-and-ink drawings to impart its Buddhist moral. The second is “A Rat in the Country of Yong,” Herve Tanquerelle’s playful, wordless story about a mouse visiting Seoul. The surrealistic imagery — skies full of dragon transports, streets filled with animal-eared people, pools inhabited by monstrous carp — and Chaplin-esque physical comedy evoke the strangeness and excitement of visiting a new city without falling into the trap of essentializing its people. Both comics attest to the vitality and richness of the “as viewed by” concept, and suggest what might have emerged from this sometimes insightful, sometimes banal French-Korean collaboration. To be fair, the book is The -Art- of Osamu Tezuka. I think you’re right that more biographical material could have lent more context to some of the art, but then again, the subject of the book isn’t the man, himself. You did a great job with it though, I’d think books like this would be a pain to review. It seems like it would be like critiquing the commentary track on a movie. You’re absolutely right about McCarthy’s book—I probably wouldn’t have said much of anything about the biographical content if the publisher hadn’t been billing the book as “the first authorized biography of Tezuka in English,” which it really isn’t. It’s a handsomely illustrated guide to Tezuka’s most important works, with some thoughtful commentary on his work process and storytelling techniques. I’m very glad I purchased it; I know it will come in handy whenever Vertical releases a new Tezuka title! As for reviewing the book, I actually found God of Manga easier to review than fiction; almost all of the papers I wrote as an undergraduate history major were glorified book reports of one fashion or another, so critiquing God of Manga felt weirdly comforting and familiar.